It may be the end of summer, but the Kona Kai Swim and Racquet Club still had one more celebration up its sleeve. 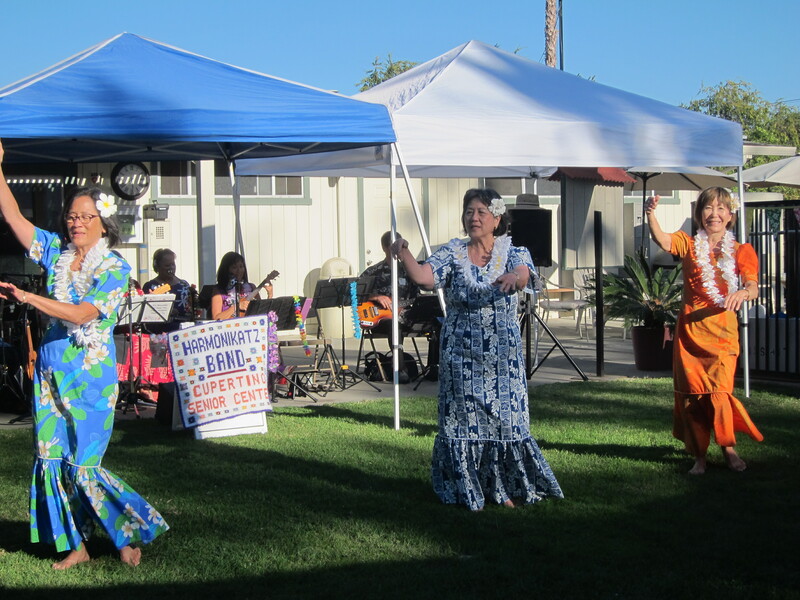 On Sept. 8, members were invited to celebrate the club’s 60th anniversary with a Luau-themed party. Upon entering Kona Kai, guests were given a nametag with the year in which they joined the club. Guests enjoyed a Hawaiian-themed dinner, including spam musubi and a whole roasted pig. 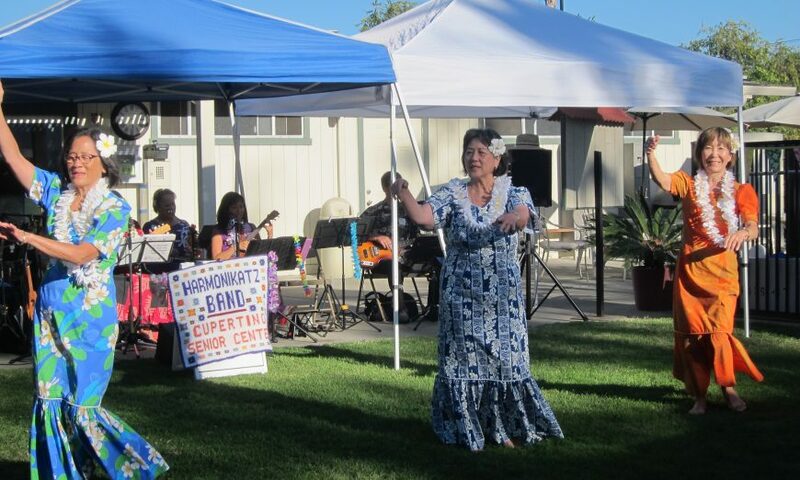 After dinner, the Cupertino Senior Center’s Harmonikatz Band played soothing Hawaiian tunes while three of their band members, Jennifer, Gail and Melissa performed a hula dance. Sharon Hirozawa, Kona Kai’s club manager, told the story of how it all got started. In 1958, neighborhood homeowners bought land and dug a swimming pool. As more members joined, the club began to expand. Kona Kai now has tennis courts, a basketball court, lockers with showers, a full kitchen and banquet room. While Hirozawa had everyone’s attention, she played a fun game with the guests. She asked everyone to stand up and then proceeded to say, “Anyone who has been a member for one year, please take a seat.” A handful of people sat down. As the number of years increased, members who were now sitting down were in awe of those still standing. Javier, who has been a member since 2007, was one of the people who sat down early in the game. “I’ve been playing tennis since I was 9 years old,” he said. He joined Kona Kai because it’s close to his home, the price of membership is fair, and he enjoys spending time with his family there. 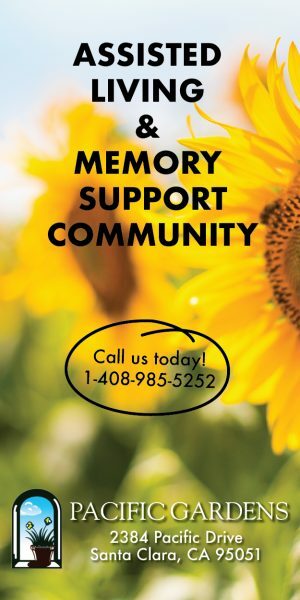 “As long as we live here, we’ll be members here,” he said. Mary’s good friend and fellow tennis player, Ally, joined in 1979. The two friends are competitive on the court, but “once we come off the court, we forget about it,” said Ally. Hirozawa’s game finally concluded when only one couple was still standing: Marty and Ken Jones. The Jones’, Hirozawa told guests, have been members for 57 years. The audience was shocked and impressed. Everyone clapped loudly for them. The event concluded with a hula dance lesson, which many members were looking forward to.